More people were diagnosed with end-stage kidney disease per capita last year in Manitoba than any other Canadian province excluding Quebec, according to a new report from the Canadian Institute for Health Information. In 2017, 327 people received the diagnosis in Manitoba, for a rate of 244.4 per million people, the CIHI report states. That’s compared to the overall Canadian rate of 197.7 per million people, and the second-highest reported provincial rate of 216.5 per million in Ontario. The health institute left Quebec out of provincial comparison because of under-reporting in that province, the report says. Juliana Wu, manager of the Canadian Organ Replacement Register at CIHI, said the institute didn’t dig into the factors influencing numbers in each province. But she said Manitoba’s results could be due to a difference in its population mix compared to other provinces, or a greater rate of diabetes. Among people living with end-stage kidney disease, the report found Manitoba also had the highest rate of diabetes as the primary diagnosis. Just under 43 per cent of the province’s population with end-stage kidney disease had been diagnosed with diabetes or a rate per million people of 728.6, compared to the national rate of 407.8. With a 35 per cent overall jump in end-stage kidney disease across the country over the past decade, Wu said the information in the report could suggest useful approaches to policymakers. “From a policy perspective, it might be worthwhile considering … how do we control, how do we better manage diabetes within that province?” Wu said. The report, which looked at 10-year outcome data on patients treated for end-stage kidney disease across the country, was released by the health institute late Monday evening. 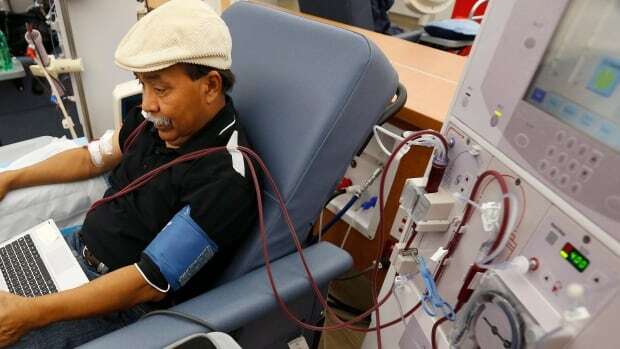 It found that 16 per cent of patients on dialysis survive past 10 years on the treatment, compared to 74 per cent of patients who received kidney transplants who still had a functioning kidney after 10 years. She noted that treatment options exist even after a kidney transplant fails in a patient, so overall outcomes for patients who get transplants can be even better than the 10-year data suggests. In general, results among patients who received transplants from living donors were better than those who received one from a deceased donors, the report notes. Across Canada, the rate of deceased organ donations increased by 51 per cent between 2008 and 2017, the report said, while the rate of living donations dropped by 11 per cent. Wu highlighted progress in Manitoba on the organ donation and transplant front in recent years. Manitoba had the highest overall rate of patients who received transplants from living donors, the report found, at a crude rate-per-million of 20.9. The second-highest was in the combined region of B.C. and Yukon, at 17.5, while the lowest was in the Atlantic region at 3.3. There were 803 deceased organ donors in Canada in 2017 — 43 more than in 2016. However, the number of living donors dropped by nine from 2016, with a total of 535 in 2017. Across the country, there are more than 4,300 patients waiting for transplants and a shortage of organs, the report says. In 2017, 242 Canadians died while waiting for a transplant. The biggest takeaway from the report is the importance of increasing public awareness of organ donation, Wu said. “The only way we can have more kidney transplants completed is to have more kidney donors, right?” she said.